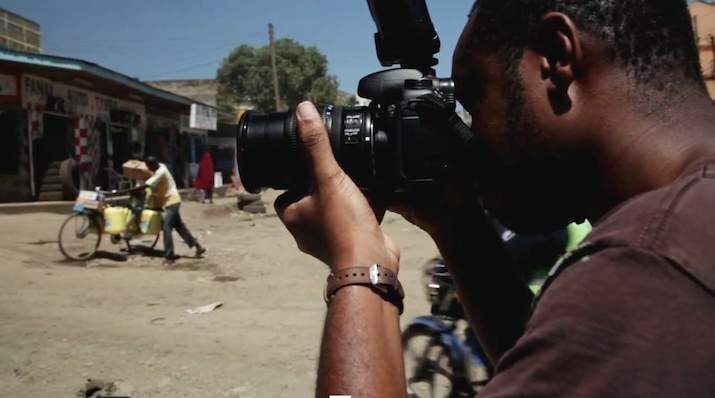 FRAMED documentary investigates what's behind the West's fascination with "saving Africa"
In FRAMED, documentary filmmakers Cassandra Herman and Kathryn Mathers follow Boniface Mwangi, founder of PAWA254, as he explores the attraction of "saving Africa" and investigates the images and myths that cast a continent as a victim. FRAMED, turns a lens on popular representations of Africa and Africans, as seen through the eyes of Kenyan writer Binyavanga Wainaina and South African born educator Zine Magubane, who ask a chorus of questions about the selling of suffering. Recognizing that people want to do good in Africa, the film raises questions about privilege, power and the misrepresentation that arises from the relationship of aid. "Images reach us faster today than ever: through Facebook, Twitter, 'voluntourism' dispatches, and branded social causes," explain the producers. "Our response to the images we see of Africans makes us feel like good, caring people who can make a difference. We want this film to speak to that sincere intention, by taking a second look at the framing of Africa in crisis, and listening to African experiences and perspectives; to explore how our “saving” ultimately undermines the agency and self-determination of Africans, and how we might be complicit in creating the same inequalities we hope to erase." Hoping to incite not only discussion, but also self-evaluation the film takes a look at hashtag campaigns like #StopKony and more recently #BringBackOurGirls and prompts us to consider how and where we do good in the world. "Why did millions of young Americans seem to be angrier about a faraway Ugandan tyrant than two protracted wars, a shattered economy, and social inequality at home? Why is it easier to engage online or overseas rather than in our own communities? At a time when many Americans are struggling to find a job or put food on the table or pay for mounting student debt, we think that FRAMED will inspire young people to tackle social inequality locally and nationally," the producers challenge. What FRAMED hopes to impart is the complexity surrounding humanitarian interventions and how hashtag campaigns oversimplify political or social issues. Moreover the film highlights African writers and artists contributing to the combat against "saving Africa." Check out the trailer for the FRAMED documentary above.